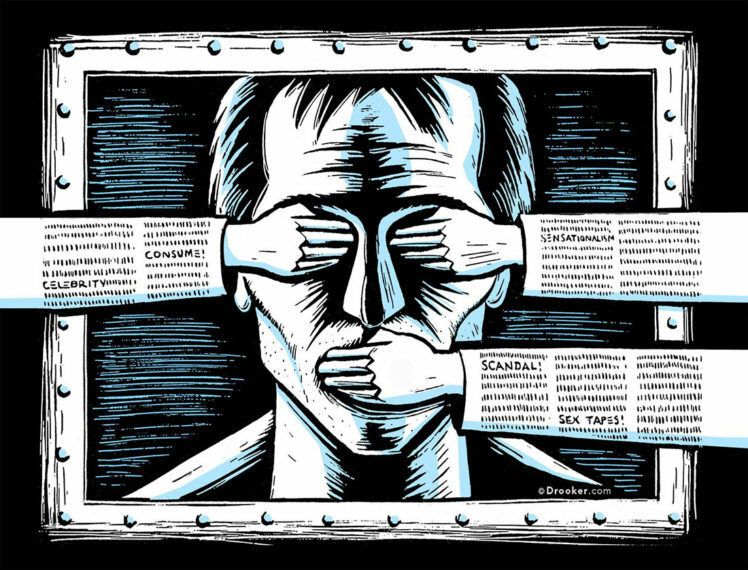 FreeNet Ukraine Coalition condemns the latest attempt to introduce censorship in Ukraine under the pretence of countering Russian propaganda. On 7 November 2018, a number of Members of Parliament, including Ivan Vynnyk, Oksana Bilozir, Olena Matuzko, Tetiana Chornovol and others registered a draft law # 9275 “On Amending Certain Laws of Ukraine on the Protection of Information Space” in the Parliament. The draft law suggests granting the Verkhovna Rada of Ukraine the unique authority to submit the proposals to the National Security and Defence Council of Ukraine on applying sanctions against mass media outlets, broadcasters, TV and radio organizations and other information agents in the sector of TV and radio broadcasting, their founders and beneficiaries who are residents of Ukraine. It should be noted that the Law of Ukraine “On Sanctions” only allow for applying sanctions against the citizens of Ukraine if they conduct terrorist activities. Thus, the authors of a draft law suggested considering “information support to the terrorist organizations, illegal armed formations and other actors that conduct, take part or contribute to the terrorist activities, occupation of the territory of Ukraine, armed aggression against Ukraine” an element of terrorism. This support may entail creating or disseminating information that promotes, commends or positively covers such actors. While condemning any manifestations of terrorism, FreeNet Ukraine Coalition believes that the provisions initiated by the draft law cannot be considered an effective tool to counter current threats and, unfortunately, create yet another opportunity for the authorities to arbitrarily and illegally interfere with the freedom of expression and media activities (including Internet-based media). That is especially critical given the coming elections. Applying the Law “On Sanctions” to restrict media activities is in contradiction with Article 34 of the Constitution of Ukraine that provides that the restriction of the freedom of expression may only be regulated by law rather than the NSDC decisions or Decrees of the President of Ukraine that enact such decisions. Moreover, according to the principle of legality, the restrictions should be clear enough to enable foreseeing the consequences that a certain action can yield. A quality law should provide adequate protection from uncontrolled actions and clearly determine its application and scope of powers granted to the state authorities with regards to imposing restrictions. Authorizing the Verkhovna Rada of Ukraine to exclusively identify mass media outlets to apply the sanctions against not only will extend the practice of illegal banning and terminating the activities of media but also will create real threats of political censorship and pressure on mass media during the electoral campaign. This draft law does not establish a procedure and clear assessment criteria to decide which media outlets should be subject to sanctions. The suggested definition of “information support” allows for arbitrary interpretation – for example, any mention of the illegal formations in mass media may be plotted as if a media outlet promotes the illegal formations and thus amount to terrorist activities. Therefore, the MPs will be virtually granted an unlimited right to interfere with mass media if they simply want to. When it comes to restricting illegal content on the Internet, the different court mechanisms should be developed in compliance with international human rights standards. For example, according to Recommendation CM/Rec(2016)5 on Internet freedom, the restrictions should be based on a decision by a court or an independent administrative body that is subject to judicial review. The decision should be specific, targeted and based on the evaluation of efficiency of restrictions and risks of excessive banning. in implementing the policy in the area of information security, to be guided by the principles of legality and rule of law, do not allow for restricting human rights without complying with the provisions of international law and national law.